Wrong size selection is one of the main reasons for return. Prime AI has developed proprietary neural networks to understand the best match between customers’ individual fit preference and body shape with garment specifications. 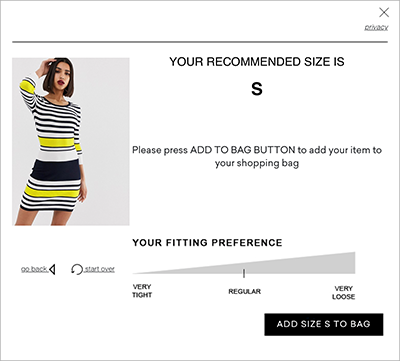 A machine learning algorithm calculates, validates and offers size recommendation in real time directly on retailer’s product description page. Thus eliminating the need to open and understand a traditional size chart. 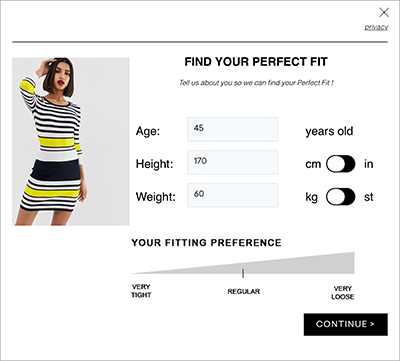 Once a customer has responded to a short query form, he can browse freely through all items for sale while the algorithm instantly updates and advise on best fitting size, which Prime AI calls the "Perfect Size". This method of size recommendation is significantly more accurate and easier to use than trying to understand an old-fashion size chart. 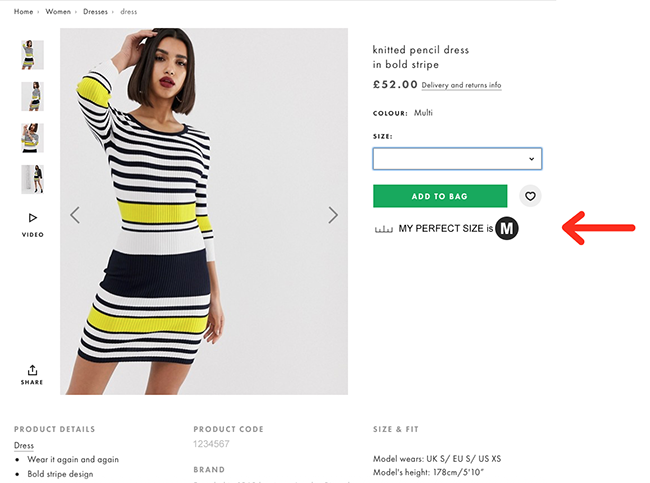 Integrating artificial intelligence to a product description page will reduce returns for fashion retailers. That’s a fact. Prime AI's tool enable customers to buy the most suitable fitting size on their first transaction, which will reduce the number of customers buying multiple sizes with intention to return. Data collected about garment specifications and customers’ preferences will clearly identify where missed sales opportunities for any online business are. Let customers’ data tell you what sizes to keep in stock or new sizes to bring in. For instance, consider: - What is the size ratio of your customers versus inventory available to buy. - How many customers did not find big enough or small enough size. 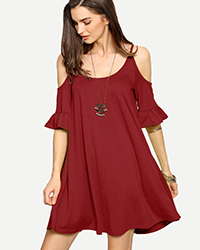 - Product conversion ratio by age group allows to focus research and development department (R&D) to adjust clothing offering. Customers’ data is key in inventory optimisation strategy, and combined with Prime AI technology, benefits will be seen both in e-commerce and physical stores. For first-time visitors, one of the main concerns is how the selected size will actually fit them. Customers have two options: either study classic size chart or buy several sizes and return unsuitable garments. Situation is even more complicated when shopping on multi-brand websites. Since each brand sizing is different despite same naming convention. As a result, customers must spend a lot of time in making decisions, and many will simply give up. Prime AI personal size recommendation significantly increases confidence of online shoppers, especially in the case of first-time buyers. TEST PRIME AI WIDGET NOW ! Prime AI size recommendation widget is already making a significant difference to its clients bottom line. We build tailored neural networks for each retailer to get the best results in reducing returns, increasing conversion, optimising inventory and identifying missed sales opportunities. Prime AI understand that each retailer has different customers but also different business models and strategies: single brand, multi-brand, fast and luxury fashion, each facing different challenges. The technology is hosted by Prime AI servers, but all interaction happens without leaving the retailer’s website. Allowing customers to find the perfect size and add to its basket or sign up for back-in-stock notifications. This feature enables to grow customer database and gives retailers an instant second chance to sell returned item to someone who is waiting for it. Prime AI experience has shown significant impact on reduction of returns with benefits extending to lower costs in logistics, warehousing and customer service department. In addition, new customer acquisition is seen to be accelerated. Get 60% higher sales conversion from product description to order ! At Prime AI, we are proud to offer real tangible solutions that will benefit your business. We don’t charge for implementation and only charge based on results delivered. Also, we share all data 100% free and fully accessible for all our clients to analyse and build stronger businesses. Adding the Perfect Size instant recommendation tool to your website could not be easier. Only two pre-defined lines of code have be added to the product description page for the widget to appear. For our machine learning algorithm to improve recommendations we will need some sales and returns data, which can be provided via different methods. Prime AI will develop any required additional code or script that may be required to suit your specific website, branding and maximise customer experience. We can integrate to any website or e-commerce platform. You don’t need to put any effort in providing garment specifications to us. The team at PRIME AI will gather all information to prepare accurate initial sizing models using the company's generic sizing models that can be tuned to follow standard size charts as a starting point. To find out what we can do for your business contact us now!